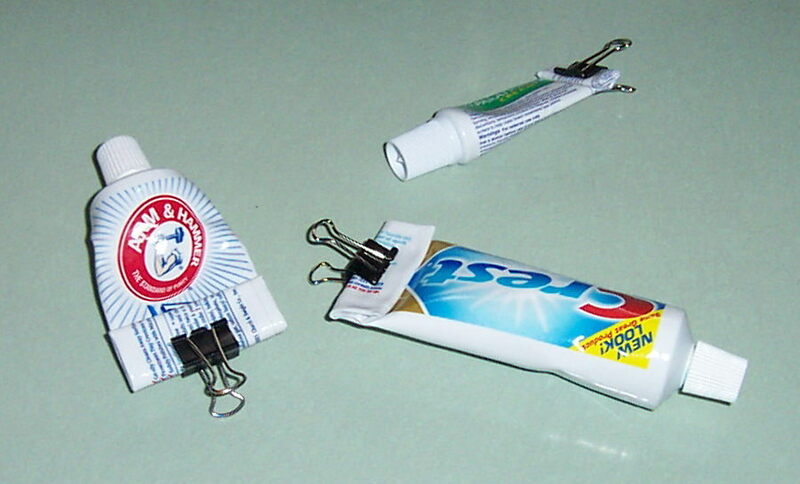 Paper clamps have a number of uses around camp and you home. Use them to close partially used containers or to close freeze dried food pouches while the food reconstitutes. As shown to the right, they work great for keeping containers rolled up. I carry a very small bottle of Clorox bleach for purification. Put a few drops in the rinse water when washing dishes. It also can be used as a back-up to purify drinking water in emergencies. Never pour the wash water into the "thunder box" or near the lake, even when using biodegradable soap. I rarely do my cooking on the ground. As you will see in many of my trip pictures, I turn a canoe over and wipe it down with a sponge to make it my cooking and serving table. This campsite had a ready made bench to give added space. Notice the paper towels. How could we survive without them? Egg life can be extended without refrigeration by dipping them in boiling water. I take this a step further by dipping them in paraffin. Allow them to cool before placing back into the egg carton. The paraffin somewhat ruggedizes them and they keep very nicely without refrigeration for as long as one week. I have heard they will keep as long as 6 weeks, but I can't be responsible for the results. The trick is to keep them from being crushed. See my food page for packing crushables. This is another hint most experienced paddlers know. Put bungee loops on each canoe deck for storing the painter and a sponge. The sponge is most often used to pick up splashes and dirt from the canoe floor. 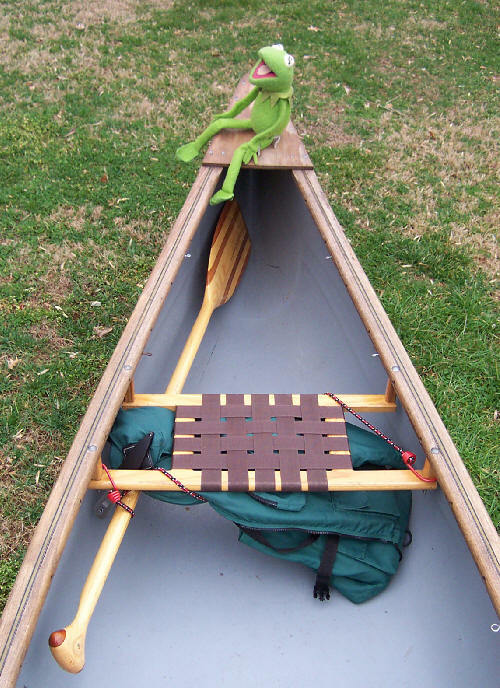 Kermit and his pals hang onto these deck bungees. Bungee? Bungees have a myriad of uses. Most everybody uses them to secure items to packs. Our gang uses them to secure PFD's in the canoe. One bungee of the right length will secure both the PFD and a paddle to the canoe seat. Each paddler does this immediately upon arriving at the portage. It reduces the number of items to account for on the portage. 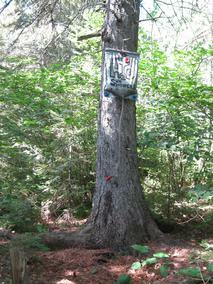 Notice that the PFD is under the seat so it won't hang down when the canoe is turned over for carrying. You can enjoy fresh meat the first day out. Freeze everything at home and transport it in a cooler. On really long trips I have used dry ice to keep it frozen. Transfer the frozen items into a smaller soft side cooler when loading the canoes. Keep this protected from the sun's heat. The items should keep well for about 24 hours. We usually have steaks the first night out and have to defrost them before cooking. The next morning I make sausage gravy using precooked, frozen sausage and serve it over oven baked biscuits with fried eggs, Tang and coffee. Another way to preserve fresh meat and cheese is to wrap it in a vinegar soaked cloth. Then enclose this in aluminum foil. One site suggests dipping the cheese in parafin. Sounds like a good idea. Cooking hint: Always use seasoned tenderizer. Then apply Season All or Red Robin seaoning to your steaks while cooking on the first side and Krazy Mixed-up Salt after turning them. Yummm! Janes Kraz Mixed up Salt is hard to find in some areas I have posted links to various spice houses that have gone out of business. I am pleased to tell you that, like everything else, you can now order it from Amazon. I have seen a number of posts on bulletin boards regarding the keeping of mayonnaise. The little foil packets from deli's and fast food restaraunts are ideally suited to wilderness camping. If you can't find them you may want to consider purchasing a small container and carrying out the unused portion. The small containers are also available in plastic for venues like Algonquin Park. I have heard from others that mayonnaise will keep without refridgeration if protected from contamination. In this case you will want to open the container and remove the desired amount using a clean utensile. Immediately close the container. Never go into the container with a utensile that may be dirty, or leave the container open. Now here is an environmental friendly idea. Unfortunately many trippers use the lakes and streams to bathe. Even with bio-degradable soap this is a bad idea. We drink this water and I don't relish to idea of drinking water from someone's bathtub. Solar showers are available from most oufitters. They come in various sizes up to 5 gallons. A five gallon shower will serve two or three people if they are careful with consumption. Normally the vinyl bag is laid in the sun for a few hours to warm the water. We usually don't have time for this and heat some water on the fire. It can be mixed with cool water to adjust the temperature. It works great. One of the best tips yet, Jane's Crazy Mixed-up Salt. When spring arrives a very large number of fishermen and a few other hearty souls will be looking for “ice out” to begin the first trip of the year. Some of us in the lower 48 states have the opportunity to canoe on unfrozen waters, albeit still very cold, throughout the winter season. Our page Potpourri of Rivers and Trails shows some winter canoe scenes in Pennsylvania. Boating on ice cold waters carries with it a very real hazard of exposure and death. This is especially true if canoeing with young children. Most of us are familiar with of hypothermia, but I want to reiterate some of the cautions as well as reveal some new information that has come to my attention. I remember in my younger years when canoeing with my children on Pequa Creek Near Lancaster, PA. When they overturned I didn’t take the situation seriously enough considering the dangers they faced because I was unaware of the facts. Fortunately they survived, but they have never forgotten the cold. Children and the aged are affected much faster than young adults so be alert to the symptoms of hypothermia which are; trembling, slurred speech, pale or waxy appearance, drowsiness, shallow breathing, and/or incoherence. These symptoms are not easily self-diagnosed because the cold also causes poor judgment. Be sure to take warm clothing, especially wool. On water, you must wear your PFD. Not only will it help keep you warm but it will keep you afloat if you lose consciousness. Don’t be fooled into thinking you can put it on after you have upset or fallen into the water. If rescue is eminent, stay with the boat, swim only if you must. Swimming cuts survival time in half. Do NOT give alcohol for treatment. This dilates the blood vessels near the surface and carries the cold blood to the body core. DO take warm dry clothing in a drybag when on the water. DO remove wet clothing. Put on warm dry clothes or wrap the victim in a blanket. In severe cases you can get inside with them. Remember, hypothermia can easily occur on land in cold damp weather. Now for the new information. It has been found that the shock of the cold water can cause an involuntary gasp. If your head is under water this can cause immediate drowning and helps explain why some good swimmers simply fall into the water and disappear. Also, your ability to hold your breath can be dramatically decreased in cold water from as long as 45 seconds to 9.5 seconds or LESS! There is also a propensity to hyperventilate in cold water that further increases confusion and dizziness. For more information on survival techniques Click here. 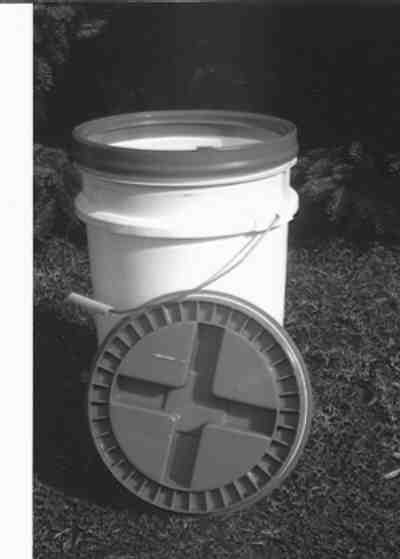 The York Pack 200 Dry Box was featured in the Spring 1996 issue of Pack & Paddle. This is one of many items to keep gear dry. Nothing can ruin a trip like wet gear, or ruin your life in cold weather. Here are some additional tips to keep things dry and help to make a safe enjoyable trip. Gear can get wet from rain, canoe upset, and water splashing into the canoe. If you are prepared for upset you are fairly well prepared for the other two, but it helps to take all precautions. 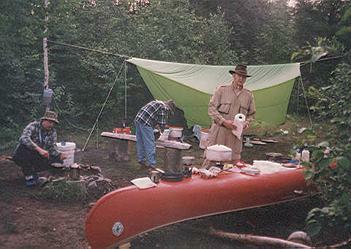 The Maine voyagers will advise you to place two poles in the bottom of the canoe on which the packs are laid. Whether from rain. splashes or just an leaky boat, the poles prevent the packs from getting soaked from the water that collects in the canoe. Soaked packs add weight and get your clothes wet. Working with wet gear is nasty even if it isn't harmful. In conjunction with the poles, pack covers are sufficient to protect from splashes and falling rain. But the really important protection comes from your choice of packing containers. 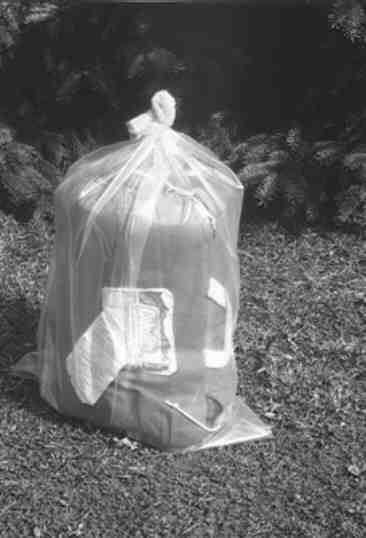 Many novices make the mistake of using plastic garbage bags. These bags are too thin and easily damaged to give the protection you need. If you have used them you probably know that there is some kind of magical one-way valve that lets the water in but not out. I have successfully used plastic mulch bags available from many nurseries. A sleeping bag will manage to fit into one of these bags. They can also be used as pack liners. The gear is placed into the bags the tops are tightly twisted, the twisted plastic folded back over itself, (goosenecked) and tied with sash cord for full protection. The best way I have found to protect gear is commercial dry bags. I use the 6500 cubic inch Sealine bags available from most camping suppliers for less than $100.00 I put clothing in stuff bags and put these in the dry bag with the sleeping bags. If there is room I will also put the tent in the dry bag. Usually the tent, rain suits, ground pads and other gear that is not appreciably affected by water is put in, or attached to, regular backpacks. I carry food in 5 gallon plastic buckets. Among a host of other advantages, these are virtually water tight and make excellent camp seats. For some items in the kitchen pack that need to be protected I use individual containers such as Tupperware. Zippered plastic bags can also be used but these are not very reliable and only keep water out for short periods of time. Small specialty dry boxes are available for cameras, weather radios and other very sensitive gear that you want to have at your side while paddling. Addedum 2002. Over the years I have found very few things to be 100% water tight. I do not leave my plastic buckets where they can sit in the rain. Water is captured around the lip and slowly seeps in. If you experience an upset, be sure to open buckets and dry bags to make sure no water remains inside. The sooner water can be removed and the gear dried out the better. We all use batteries around home and on wilderness trips. (Kermit insists on calling them cells, and this brief discussion will be limited to cells). The old carbon zinc cells are just about history. Many new types are available having diffrent advantages and disadvantages. We will try to cover a few for your benefit. Most cells sold today are alkaline. You have undoubtedly seen Kermit's friend, the Pink Rabbit, powered by these cells. Unfortunately, they finally do run down becoming trash, not to be left in the wilderness. Alkaline rechargeable cells are now widely available in stores. They can be recharged up to 100 times but they do not have the capacity of ordinary cells, (they last about half as long). The good features are that they do not have memory problems like nickel cadmium and they do not discharge during storage. See Rayovac alkaline rechargeables for more information. Nickel cadmium (NiCad) cells allow recharging and provide high peak current. However, they have three problems; if not fully discharged they develop memory and loose capacity; they have internal discharge and do not maintain capacity during storage; and dispoal of cadmium poses an enviromental problem. NiCad's can be charged as many as 1000 times. They are quickly falling out of favor with the advent of nickel metal hydride (NiMH) cells. Nickel metal hydride cells are the highest capacity of commercially available rechargeable cells. They do not have memory or disposal problems. Like NiCad's, they can be charged 1000 times and discharge during storage. See Rayovac NiMH or Energizer NiMH for more information. These sites are full of battery specifications. Lithium Energizer e2 cells are are now available. These very high capacity cells are superior in performance but they are not rechargeable. The operating temperature range is from -40 to plus 140 F, not that I would like to try using them in either extreme. I found these useful in my digital camera that didn't even respect the rechargeable NiMH cells. Digital cameras make film buying and developing obsolete. You can take as many pictures as you want and keep or print only those you like. Really good printers start around $160 US. You can print really superb pictures on photo paper up to 8 X 10 or good pictures on high quality ink jet paper. The colors are great and do not fade like they did just a few years ago. The money saved by not printing bad pictures should offset the cost for printer cartridges and photo paper. What's more, you can e-mail your photos or publish them on the internet with the finest of quality. Here are some basics to help you in selecting a digital camera. First, avoid the cheap digital cameras you might see costing less than $100. Basically, you do get what you pay for. Cheap cameras will not produce sharp images near the edges of the photo. Start by considering the number of pixels. The number of pixels is going up with each new camera. The higher the number the better the image, and the more storage space required. Start by looking at cameras of at least 5.0 mega pixels. This will give pretty good resolution even in 8 X 10 blow-ups. For larger size pictures more megapixels will be required. Next you will want to consider the zoom capability to pull in those distant images. Zoom is either optical or digital. Optical is what counts and is what drives up the cost of the camera. Digital zoom sacrifices resolution. You can do the same thing as digital zoom when you get the image on your computer. I recommend no less than 10X optical zoom. Image stabilization is imperative when zooming to over 10X unless you are using a tripod. Technology has changed considerably sine I first wrote this guide. Most storage is now on SD memory cards that can hold as much as 128GB. The price has come down to about 50 cents a gigabyte and you can even get them with Eye-Fi that allows wireless data transfer of the picture to your computer. My new camera uses a 2 gig memory card that will hold more than 1500 pictures of 4.0 megapixels. The memory challenge now is for recording videos. Other features you will want to look for are time delay shutter, movies, rechargeable batteries and docking ports that make battery charging and picture transfer exceptionally easy. Battery life is a major consideration, especially if you are in the wilderness and away from charging sources. Look for rechargeable lithium ion batteries. They are small, lightweight, and do not self-discharge which allows you to carry a spare for extended trips. I have found that standard AA batteries of any type are insufficient. Technology has changed dramatically since 2005 when I first posted this article. Therefore, some revisions were made in 2008 and again in 2013. I just saw an advertisement for the small SD memory card with 32 gigabites for only $18 USD. This will hold more pictures than I expect to take the rest of my life! Image stabilization is coming down in price allowing sharp pictures even when zoomed in and holding the camera in your hands. I was pleased with my Kodak DX6490 (very popular model) that has\d excellent battery life. I am now using a Casio EX-H15 with 14 megapixels and image stabilization. I selected this because it fits nicely into a clear waterproof bag for shooting while paddling rough water. However, I miss the clarity of a larger lens and am looking at the Fujifilm S4500. It is small with image stabilized 30X optical zoom. Packing to Keep Things Dry. I bought a Chrysler product with a factory installed GPS system. I find it works quite well but was very disappointed that the database did not have my home address of the last five years in it. When an update was offered at the exorbitant price of $200 I bit the bullet and placed the order only to find it still did not have my home address. I also found it showed a road as a through street that has been gated and closed for over 50 years! In another case the GPS directed me through an intersection that for years has been closed with a cable stretched across it. I requested a return authorization which was denied because I had opened the software package. This seems to be the way most software companies dodge any responsibility to meet customer expectations. So, the bottom line is to beware of updates and all the hype about accuracy and latest information. We users have no way to verify that the software supplier is honest and trustworthy. As of May 2010 the software supplier NAVTEQ posted a twitter reminder of the importance to update software. I am afraid they have already scammed me. With the advent of Google Maps, Waze, and the many other GPS software apps for use on tablets and cell phones, I discourage the purchase of navigational options for the automobile. These GPS nav systems must be updated frequently at considerable expense. The internet GPS software is continously updated at no cost. The increased cost of reaching our wilderness destinations is dramatically affected by the rising prices for gasoline (petrol). Rather than cancel trips or limit travel to less remote venues, here are some ideas from Kermit to decrease the impact on your pocket book. A 10% improvement is not unrealistic and can amount to a lot on a $70 fill-up. Low pressure will cause considerable increase in fuel consumption, not to mention reducing tire life. Follow the manufacturer’s recommendations on the inside of the driver’s side door. You may want to err a few pounds on the high side as under pressure has greater problems than over pressure. HINT. Tire pressure must be checked before driving and while tires are still cool, If you don’t have a compressor, put in a little extra pressure in them at the service center and then lower the pressure to the desired amount in the morning before starting out. Like me, most people ignore regularly changing the air filter. Check your owner’s manual for recommended changing frequency. Again, check your owner’s manual. Most new cars can go 100,000 miles (160,000 KM) on a good set of spark plugs. It is important to have the fuel injection system cleaned as recommended by the manufacturer. Also, avoid discount gasolines as they are sold at a discount because they do not meet the standards of major brand products. Contaminents will leave deposits on the intake valves and in the fuel injectors. Keep your left foot off the brake. Plan ahead and avoid sudden or unnecessary braking. If the traffic signal ahead is red, get your foot off the gas early. Watch ahead for slowing traffic. Plan ahead when changing lanes to avoid disengaging the speed control. Maintaining consistent driving speed is as important as driving at a slower speed. Slower speed reduces friction and increases efficiency during highway driving. This is most important in stop-and-start city driving. In the past I premeasured bulk drink mixes and put them into Zip-lock plastic bags. I then mixed them in a 2 liter nalgene bottle for the whole group. Since drink mix comes in 1 liter or 1 quart sizes I now put the drink mix on the individual camper's checklist and let each one choose and mix their own. It saves me the space of a 2 liter bottle, reduces cost and the troouble of pre-measuring. Blender, Ice, Real Lemon juice, Triple Sec or Orange Liqueur, White Rum, Tequila, suger or Cane Syrup and Frozen Limeaide. I can't imagine the pioneers crossing the country without paper towels. I had difficulty trying to pack a paper towel roll and protect it from water. I started pulling the towels off the roll, folding them over and putting them into a zip-lock plastic bags. These fit easily into the plastic food buckets and can be distributed among several buckets if desired.